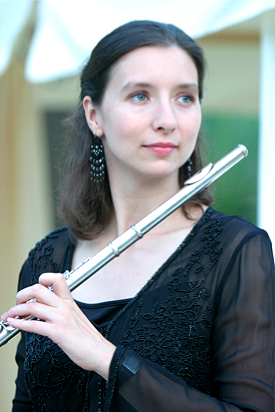 Flutist Pamela Vliek Martchev has played with southern California’s top orchestras, including the Los Angeles Philharmonic, San Diego Symphony, LA Chamber Orchestra, Pacific, Pasadena, and Mainly Mozart Festival Symphonies. She has had the honor of performing under the baton of some of the world’s greatest conductors, including Gustavo Dudamel, Charles Dutoit, Edo de Waart, Rafael Fruhbeck de Burgos, Jeffrey Kahane, Leonard Slatkin, and Esa-Pekka Salonen. She served as principal flute with the Boulder Philharmonic in CO for 10 seasons, and was also 2nd flute of Philharmonie der Nationen in Germany from 1997-98. An avid lover of chamber music, Pamela has been featured on series such as Jacaranda, Dilijan, Le Salon de Musique, La Jolla Summerfest, Luscious Noise, Art of Elan, Bruman, PIE, Hear Now, and with the Felici Trio in Mammoth. Of her playing, a 2012 LA Times review noted “....You could almost feel her breath transformed into music….” She can be heard on many commercials and movie soundtracks, on the last 2 CDs of Billy Childs – Lyric; and Autumn: In Moving Pictures, and on Chris Botti’s CD – Impressions. She has performed on the Jay Leno and Ellen shows, has played with Ian Anderson of Jethro Tull, and you can see her in the Andrea Bocelli 2009 PBS Christmas Special, the Mariah Carey 2010 Christmas Special, and the movie The Soloist with the LA Phil. Ms. Vliek Martchev went to the pre-college of Manhattan School of Music for 5 years, and continued on to get her Bachelor of Music from MSM. She is very thankful for her NY public school music education, which culminated in winning many prizes, and soloing with the Long Island Philharmonic and other LI orchestras. Her primary teachers were Harold Jones, Kathleen Nester, and Linda Chesis. She has taught at Mt. San Antonio College and Riverside City College, and is currently on the faculties of San Diego State University and Pt. Loma Nazarene University, and USD.